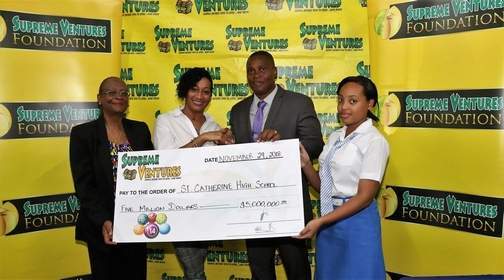 KINGSTON, Jamaica — Supreme Ventures Limited (SVL) on Thursday donated $5 million to St Catherine High School for the building of a new state-of-the-art auditorium. A small delegation from SVL, headed by chief marketing officer Heather Goldson, presented the contribution to school principal, Marlon Campbell and other members of the school executive and building committee. The handover was made in Pascal Hall, which now functions as the school’s main assembly point. Past President of the St Catherine High Alumni Association and member of the building committee, Dr Oniel Mundle said the new facility will seat 800 students with a stage, changing rooms, restrooms and a mezzanine. In addition to fostering the performing arts, the facility will host school functions and will be available to serve the wider Spanish Town area, SVL said in a release yesterday. “Spanish Town currently does not have a space for the performing arts. There is nowhere to host a play or any other performance, but this auditorium will fill that need for the community as well as the school. We still have a little way to go but this [donation] is a major chunk of the funds we needed,” Mundle said. The project, which is slated for completion in December 2019 has received the assistance of various donors, including the CHASE Fund, which threw its hat in the ring first with a donation of $50 million.